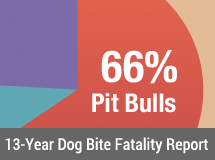 U.S. dog bite fatality citations are primarily gathered through news reports at the time of the attack. Copies of news reports are available upon request. Learn more about our data collection process. NOTE: The victim was also identified in media reports as "Christina Burleson." NOTE: Victim's name also spelled as "Jonathon Quarles, Jr."
Fatal Pit Bull Attacks: A growing archive of U.S. fatal pit bull maulings dating back to 1833. Maintained by DogsBite.org.